B.E.C maintains and repairs all major makes of gate automation systems, barriers, turnstiles and access control systems. We give an extra years warranty on all products supplied and installed by us bringing your warranty to 2 years (subject to terms and conditions). Ask for a copy of our written warranty. We have service engineers working daily in most parts of London which greatly reduce our response times over our competitors. 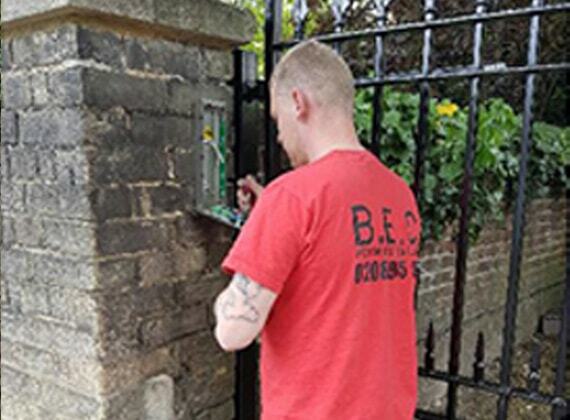 B.E.C are members of Gate Safe and qualified to offer advice, recommend and carry out upgrades to bring existing installations up to current legislation. We offer maintenance contracts on our installations and installations carried out by others subject to a risk assessment. Please ask for a copy of our contract. We use computer based service software that allows our service department to keep records that are up dated by our engineers after every job. This and that every vehicle has sat nav tracking allows our service department to get an engineer to you at the earliest opportunity For larger contracts the customer has access to this information and can keep up to date on the status of their jobs. Please see video for a further explanation.